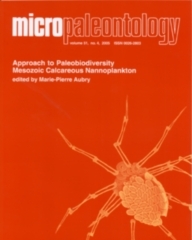 ABSTRACT: Calcareous nannoplankton diversity, evolutionary rates and species longevity show markedly different characters above and below the Cretaceous/Tertiary boundary. Excluding mass extinction events, and the initial origination and radiation, Mesozoic nannoplankton diversity is characterized by relatively continuous increasewith low background evolutionary rates and high species longevity. Cenozoic diversity is more variable and features significant Eocene and Neogene diversity declines, with little or no recovery. Cenozoic evolutionary rates are also consistently higher than those of the Mesozoic, and species longevity is low. The response of nannoplankton to climate cooling in the two eras is particularly revealing: cold intervals in the Cretaceous saw greater paleobiogeographical differentiation and high-latitude nannoplankton provinces that supported diversifying communities, whereas, cooling in the Eocene and Neogene coincidedwith diversity declines, the selective extinction ofwarm-water taxa, and high-latitude provinceswith reduced diversity. It appears likely that the presence of widespread stable, subtropical and tropical oligotrophic water masses promoted the diversification of the broadlyK-strategist calcareous nannoplankton (and dinoflagellates) formuch of the Mesozoic and into the early Paleogene. The switch to an icehouse climate, however, transformed the oceans, favouring the r-strategist diatoms at the expense of the other phytoplankton groups. The profound Eocene cooling established new, cold-water habitats that limited calcareous nannoplankton habitation and diversification, but promoted diatom expansion and diversification at high latitudes. Diatoms became the most competitive of the phytoplankton groups, flourishing in all environments but particularly those with high and pulsed nutrient inputs, although their expansion may also have been aided by tectonic and biological factors that increased the flux of biolimiting silica to the oceans.